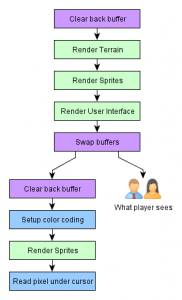 In this article I’ll try to explain how the object picking works in KaM Remake, why is it worse than in classic KaM and how it is going to get better in next release. Proceed inside if you are interested to learn how does the game knows where the mouse click has landed. Images and technical details included. Imagine players frustration clicking on a unit and getting nothing or another unit. Is there a way to solve this problem? Even in old KaM unit selection was pixel-perfect. We know it’s possible, but how? However with KaM Remake that is not gonna work because we use OpenGL for render which operates with GPU and GPU memory. On games startup we load the sprites from the disk only to pass them to video memory, as soon as that’s done we flush them from system memory (that’s some 140mb saving). Afterwards sprite data is not directly accessible to the CPU. Of course we could try and read that back from video-memory, but this is quite slow operation since GPUs are made with directional data transfer in mind. Proper GPU approach is slightly different. Since drawing on GPU is practically free, we can employ so-called “color-picking” technique. Color-picking is named so because we ask GPU to draw different objects with different colors to a “selection buffer” which is invisible to a player. 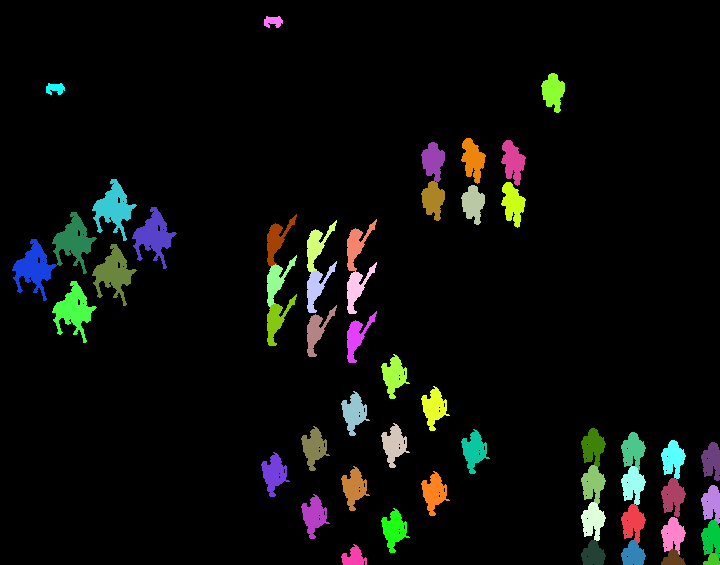 We are going to render a bunch of sprites that are already in GPUs memory (which is practically free operation). Then we read just one pixel that is under the cursor and knowing its color we can easily detect to which of the rendered objects it belongs. How is it looking from the implementation point of view? After normal frame is rendered as usually to the back buffer and swapped to display we fill everything with black (black means no ID) and render objects sprites once again, but this time we don’t show it to the player. 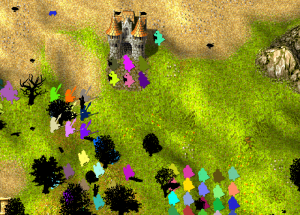 Only the game has access to the render result and read the pixel color under the mouse cursor. Now we can read the pixel under the cursor with a glReadPixels procedure and combine its RGB values back into an ID. That ID belongs to a unit that is standing there. I love reading this blog. It’s really interesting to read what stuff you guys have to deal with and how you do it. Nice article 🙂 This will be a great improvement, it’s a nice feature of modern RTS games which is missing in KaM. I’ve gotten used to clicking slightly below units now, but it will be nice to not have to do that. However, original KaM does not use pixel testing, it seems to use tile-based testing like the KaM Remake does now. 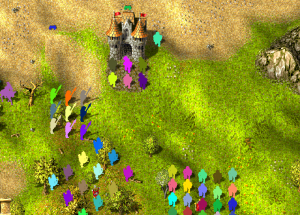 I just checked in TPR and units seem to be selectable in a square around them (same with houses). I have retested and it looks like KaM used units sprite bounds (with some modification, e.g. on Scouts). Houses were picked tile-based. Really good article, Good to know how u develope this game. 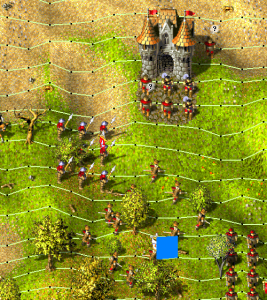 Is it possible to implement unit selection with click and drag over units? Most RTS have this feature. 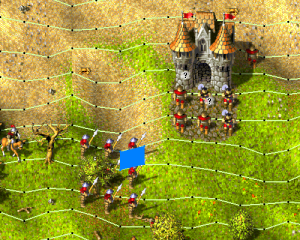 It would be nice to have some visual indicator above (or below) group of units that u can see if u pick right units. I have lots of problems with unith selection, specialy if i need react quickly. Click and drag to select multiple units doesn’t fit with the way KaM handles groups. In KaM units are already groups together and you give orders to the entire group. So it doesn’t make sense to select multiple units at once. Unless I’m misunderstanding your idea? Wouldn’t it make sense to make the sprites used for unit picking slightly larger then their original. 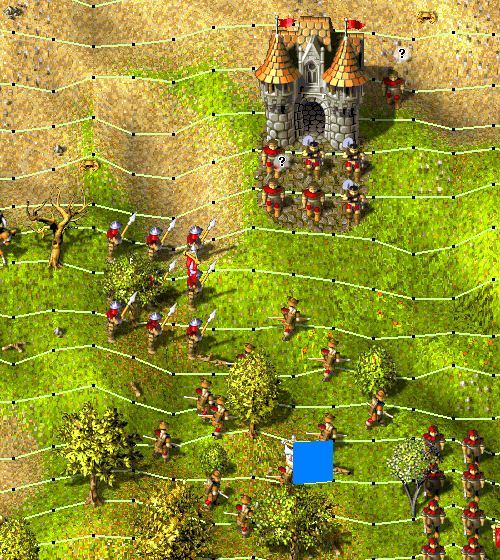 For instance when clicking a unit in the middle of a group one could click the ground by accident and nothing would happen. Is there an unfair advantage when 2 arbaletmen armies clash?